Another one of my “hop back to traditional goodies” post 😛 These certainly brings back memories! Yum! 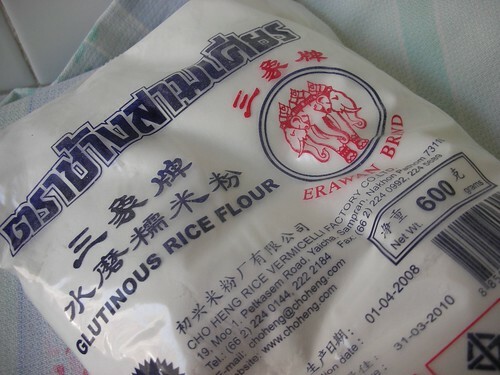 Was suppose to purchase Glutinous rice flour to make more Ang Koo Kueh, but by mistake, Mummy bought 2 packets of Rice Flour! 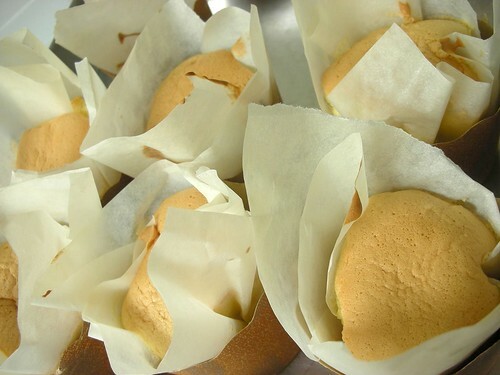 Supposed to bake this in round cake pan, however with my chiffon pan just within reach, i decide to be lazy for now. 😛 Comparing mine and aunty yochana’s, mine seems to have a darker crust. same temperature and time, i guess either my oven temperature is higher than it supposed to be or baking in a chiffon pan caused the cake to brown ahead of time. 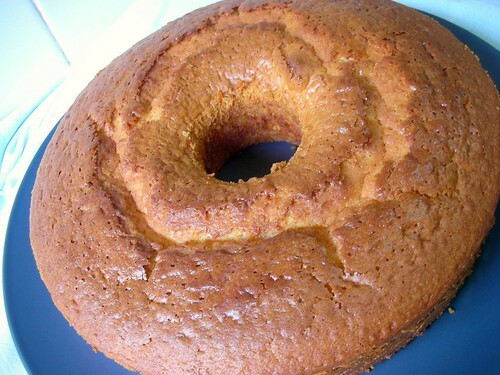 :X But surprisingly, the cake turned out really soft and moist! love it this way, nice crumbs on the outside, soft and moist on the inside. DELICIOUS! 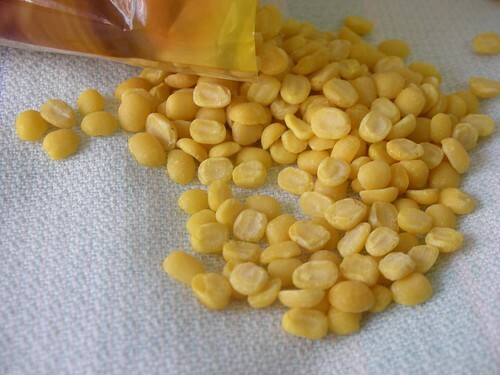 Preheat the oven to 175 Degree C.
In a bowl, lightly combine the yolks with 40 ml. of the buttermilk. In a mixing bowl, combine all the dry ingredients and mix on low speed for 30 secs to blend. Add the butter and remaining buttermilk. Mix on low speed until the dry ingredients are moistened. Increase to medium speed and beat for 2 mins. 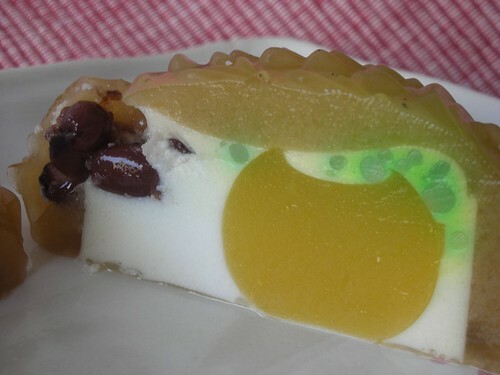 to aerate and develop the cake’s structure. Gradually add in the egg yolk mixture and beat for another min. Pour batter into an 8″ round pan and bake for about 50 to 60 mins. or till skewer inserted comes out clean. Let the cake cool in the pan on a rack for 10 mins then invert the cake onto a cooling rack and leave to cool completely. GOooooooood! I am so satisfied after baking this cake~ 😛 Thanks Aunty Yochana! 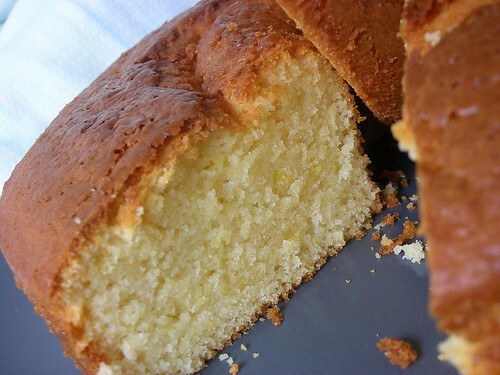 *munch* i am glad i tried this recipe + adding the lemon zest makes this cake so refreshing~ KEEPER! – . : Baker Lee :. 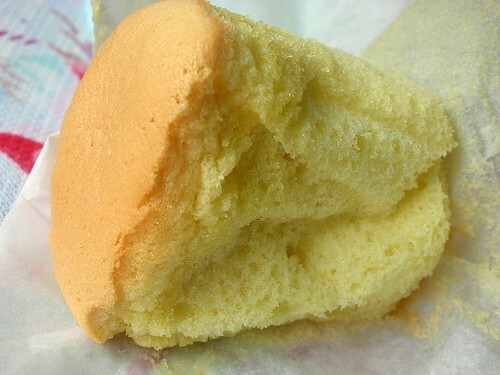 Typically found in traditional Chinese bakery, paper-Lined sponge cake is a Chinese style sponge cake which have a rich egg taste, baked in a paper cup/ muffin cup lined with baking/greaseproof paper. Spotted this wonderful Recipe from Baking Mum/HugBear’s Blog and has been on my to-do list for a long time 😛 For this period of time, i’m in a “Retro/oldies” mood, been doing alot of traditional bakes, kuehs and all… Therefore i decided to make these…. I’m really AMAZED by the results! such simple ingredients…. simple steps…. and best of all AMAZING results! 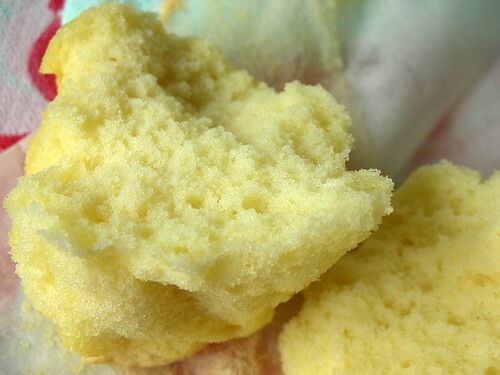 Check out the texture of the cake! *float around* i love the texture of this cake! 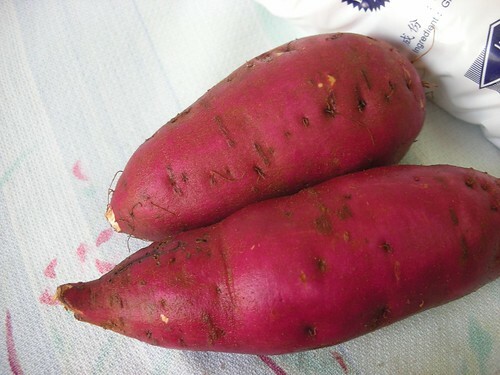 so yummy, taste really good on its own. Lined in paper makes it really easy for consumption as well. U should all try this! 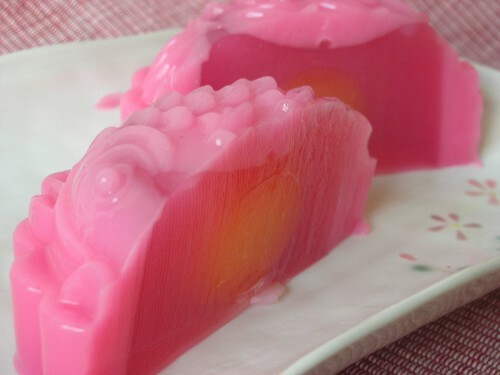 😛 Visit <HugBear’s Blog> for the recipe and all her yummy goodies or get it here! Put all the ingredients except the melted butter into a mixing bowl. Beat everything on high for at least 7 mins until ribbon stage. This means that if you use your whisk with batter to write an “8” on the batter won’t sink in but will appear visible for a while. This will be the right constitency for your batter. Add in melted butter at this stage and mix in thoroughly. 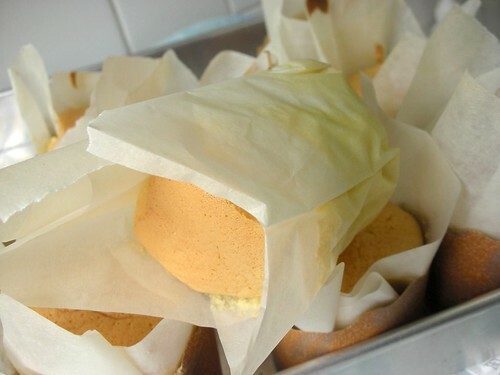 Line some waxed papercups with baking paper. Pour batter into the lined cups abt 3/4 full and bake it in a preheated oven at 190C for about 20 mins. 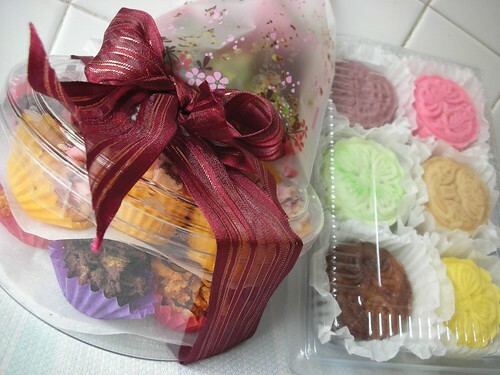 When done, remove the cake from the cup immediately and leave it on wire rack to cool. 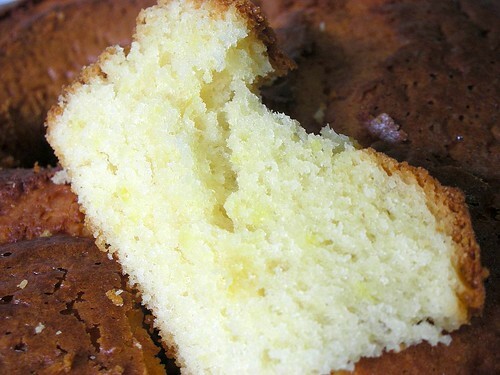 Even with the fats reduction, the cake still turns out really soft and YUMMILICIOUS! KEEEEEEEPER! Thanks HugBear! 😛 Loved it! 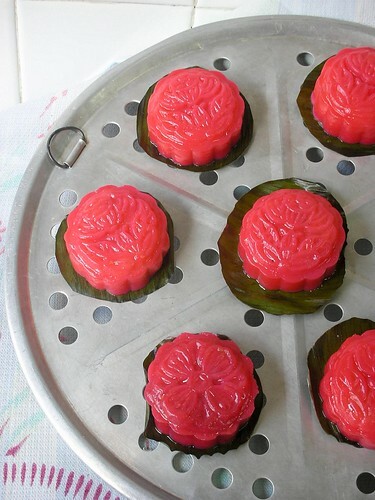 When i did <Snowskin mooncakes> with mummy sometime back, she was pretty impressed with how easy it is to use the mooncake mould bought from <Elyn> and did mention that i should get a bigger sized square and circular mould next year. I love the mould, but however the thought of packing them away and only pulling them out once a year, doesnt justify for the need to have more than 1 mould, especially when i already have 4 cool interchangeable plates pattern to play with! 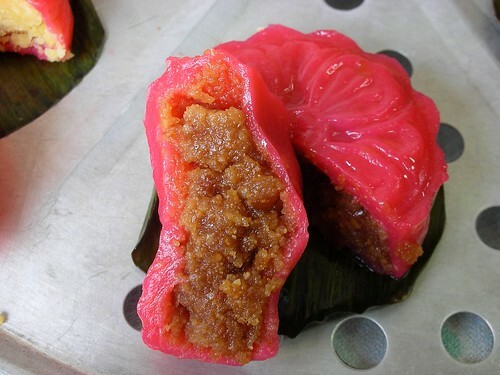 Mum strikes with the idea that we could make kuehs with them, and she went on about how simple it would be to make kueh without the all the knocking. *blink blink* woah!! 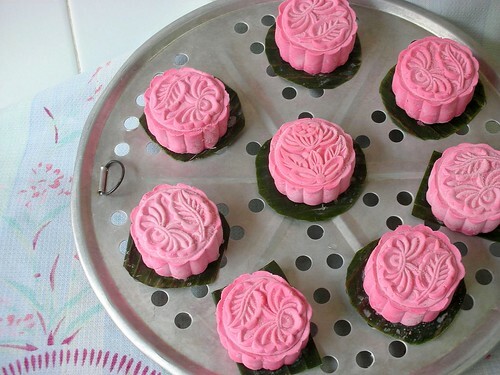 brilliant idea~ so i went to do some research and decided to experiment making Ang Koo Kueh using mooncake mould instead. =) Landed at Florence’s Blog and Tada! 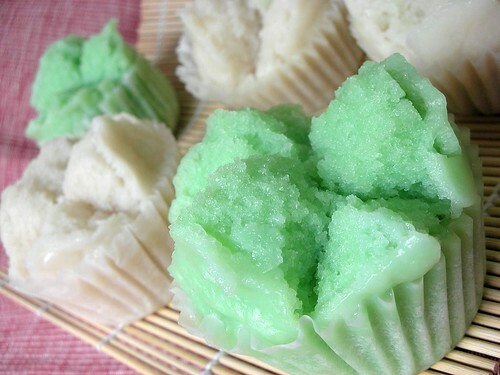 Pretty simple ingredients, u need glutinous rice flour, water and sweet potato for the skin, and the fillings will be based on what u fancy, traditional ones contains mung bean fillings, which has a sweet and salty taste. 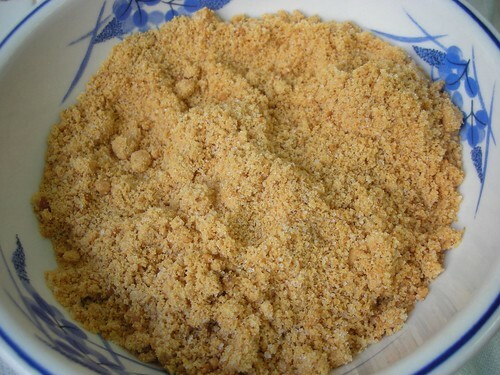 I am a lover for Peanut filling Ang Koo Kueh, therefore based on Agar-ation (estimation) i did a simple peanut filling =) 100g Roasted Peanuts grounded with 40g fine sugar, mixed together with enough water to form a soft dough. 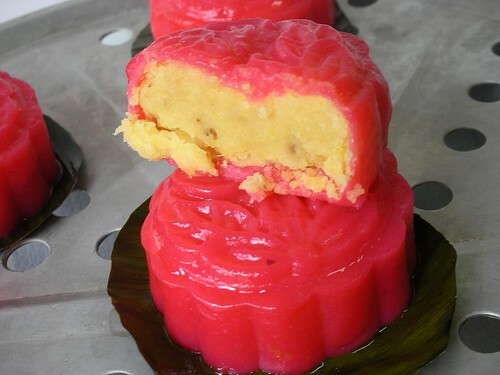 Based on my mooncake mould which was 5.2cm in diameter, the recipe yields 34 ang koo kuehs. 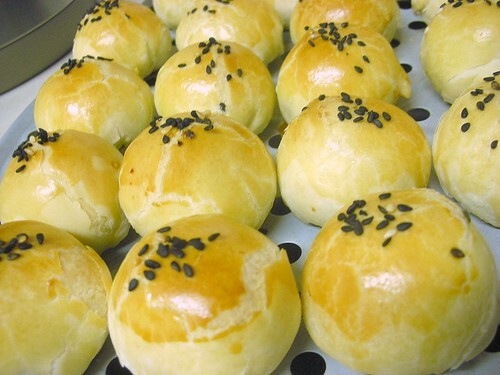 With 30g Skin dough + 40g fillings. It is really good!! the skin stays soft even after it was cooled! unlike those commerically produced! =X I am so making it again! Interested in trying out the recipe? Hop on to <Florence’s blog> now! It is worth the try! Comes in 4 flavors! 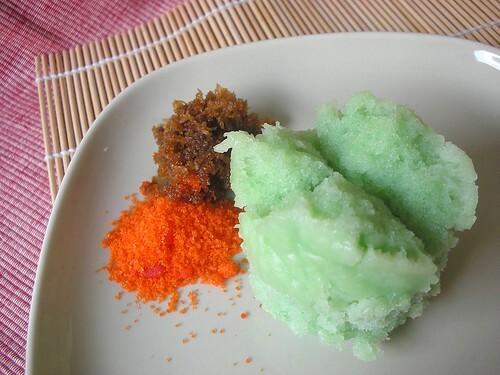 Bandung, chendol, durian and peach! 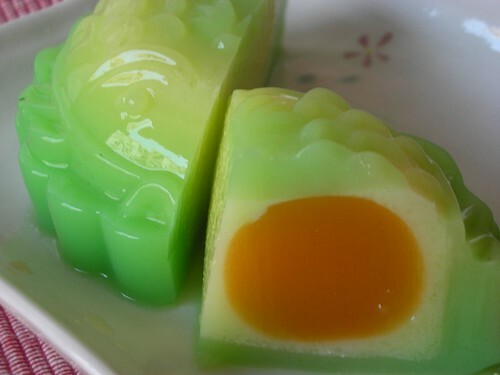 =) I love the chendol one! 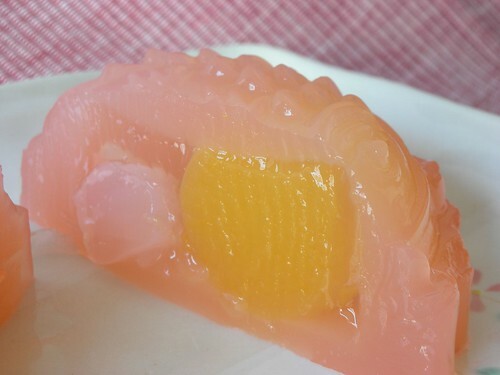 so gonna force this girl to impart skills on making this soon! 😛 let’s check out the interior! 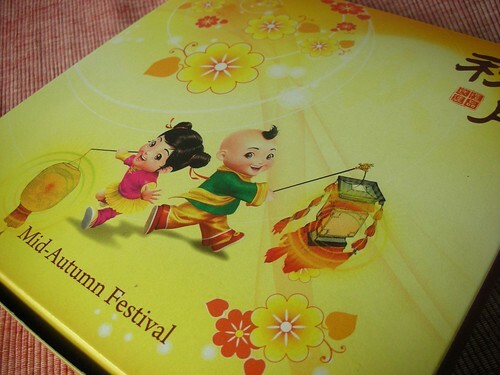 Since it is mid autumn, how can the gift not include mooncakes? 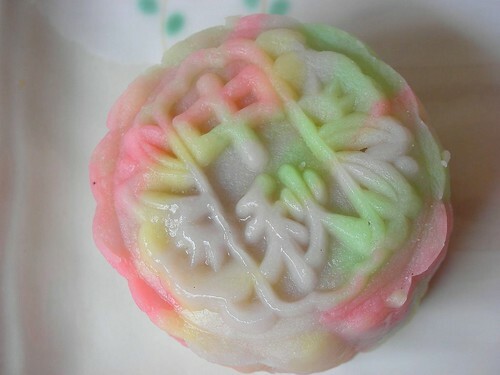 😛 tada~~ Snow skin mooncakes! 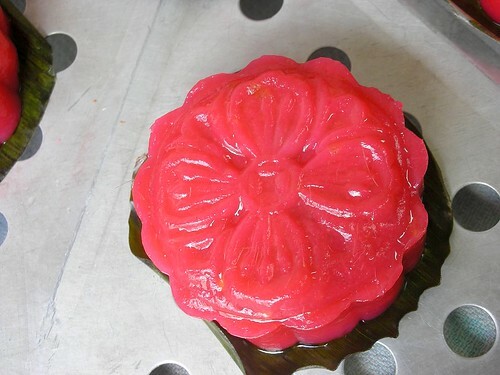 made with my mooncake mould! *grin* loan her the mould and i get rewarded in return! not a bad investment yea? creative flavors by Ling, red wine, durian, pandan, chocolate, sarsi… and i cant remember about the pink one =X is it bandung or strawberry? O.o well… wait till i try it out myself! I’m not paid but am gonna advertise for Elyn again…. 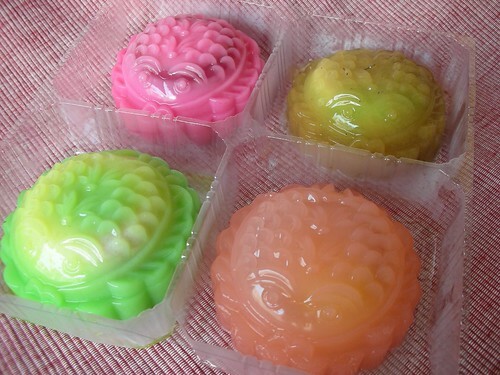 The mooncake mould is really a breeze to use! even Ling agrees… 😛 so get them next year! Visit <<Elyn’s Site>> for more information! 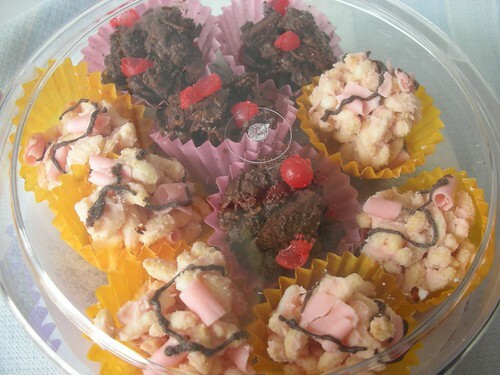 This <<recipe>> is shared by <aunty yochana>, take a look at hers! 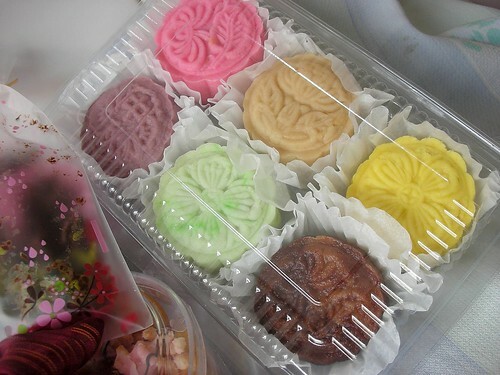 very defined colors and neat lovely shaped mooncakes. The name of this recipe sounds delicious doesnt it? 😛 Colorful and cheerful! Tried this recipe last weekend with Ling, Yani and Yani’s sister. 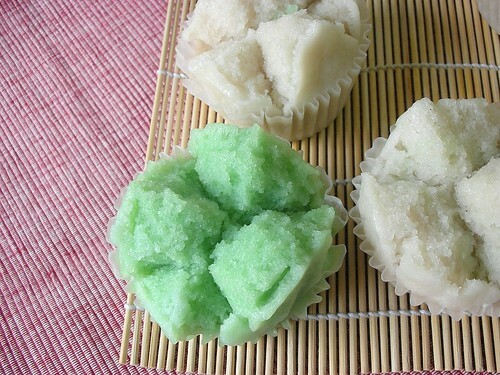 =) three of them came over to my lil home, and we had fun making our DIY Snow skin mooncakes. Was indeed enjoyable to spend time with close pals, and with 4 pairs of hands, we managed to complete over a 100pieces of these in a very short time frame. Soak the beans for at least 2 hours, steamed and mashed. Add sugar, salt & white pepper to the mashed beans. Pour in the bean mixture. 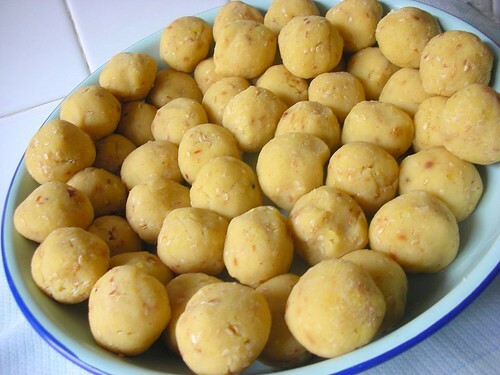 Fry till mixture dry and you are able to form balls with it. Mix ingredients for dough A together. Wrap dough with cling wrap and set it aside for 30mins. Take a portion of Dough B and wrap it around Dough A.
Flatten again and roll up. Flatten and wrap the filling in it. Brush with egg wash and top with sesame seed. Bake for 25-30mins in 175 degrees oven or till golden brown. Delicious! but tedious! =X I am so exhausted after repeating the rolling and flatten for 100 pieces! (-_-||) and they are so small… bite size. BestStar on Bye Bye 2007!